EPIC has been very well thought out, from the simple implementation to the ease of keeping it live and upto date. Some of the features we think are great..
- Ability to post custom questions which are added to the weekly survey. Makes it very quick and easy to get company wide anonymous responses to a question. If we want to know what the team thinks about something - we post it on EPIC and get the collective answer within a week. The prize store adds a great incentive which keeps participation high and also allows a colleague to transfer something of value when giving a team mate recognition. Some of the questions it automatically asks are a bit random, and the blog topic on the weekly eblast could do with some more relevance, but apart from that its on the money. Also the guys at Clarity Wave are a great support and normally take on suggestions to issues. Gives us great insight into what our people really think and how they feel. Has given us a simple and easy way to recognise each other when someone goes above and beyond. Provided an easy way to get feedback from the team, one optional question we post every week is for the team to write us a story of someone they have seen demonstrating 1 of the core values last week, we have had some great responses from this we would have struggled to get any other way. "Redesigning cultures and Improving performance"
I'm a big fan of Clarity Wave's EPIC. People spend most of their life at work (at least 8 hours a day) and if they can be happier, people will be more productive and businesses will make more money. After all anything that helps the bottom line is welcome. My favorite aspect of the program is the ability to earn points and buy cool stuff at the store. Another thing I love about it is that I get to see my own scores. This helps me keep improving every single day. At first I was a little skeptical but now I can see the power of these regular surveys. Quite frankly we like everything so far. Whenever we've had any issues the support team gets back to us promptly and with a solution in mind. Turnover was pretty high in my company so this software is helping the employees be more satisfied at work. I also like the community and the ability to recognize others and reward them with virtual points. "I was a bit skeptical but now I really believe in employee surveys"
When I first saw this system I was a bit skeptical about how it could help our small team. We are a bunch of very creative and outgoing people and we didn't really give too much thought about our internal culture. Now I realize that, no matter how small or large a team is, they all have a unique culture. When we first started to answer surveys about our agency and, more importantly about the people that I work with every day, I started to see the power of employee surveys. I guess the most valuable aspect of this software is the feedback that I personally get. After a few weeks I started to see my own scores which are anonymously given by my team and other coworkers. Now I look forward to answering questions every week. Some of the questions might not necessarily apply to our company and they're harder to answer, but I guess that's just the way the software is created. On the other hand the software allows one to create custom questions. This is where we get to ask exactly what we need about our own particular culture. A mobile app would be nice to have although the current mobile version is very good too. I'm using it to see where I can improve. In a few weeks I have found areas of opportunity where I can start making changes immediately. Also, I have noticed that I'm more aware of what my team is doing right and wrong. Being able to pin point the different dimensions that need work is really valuable to me. 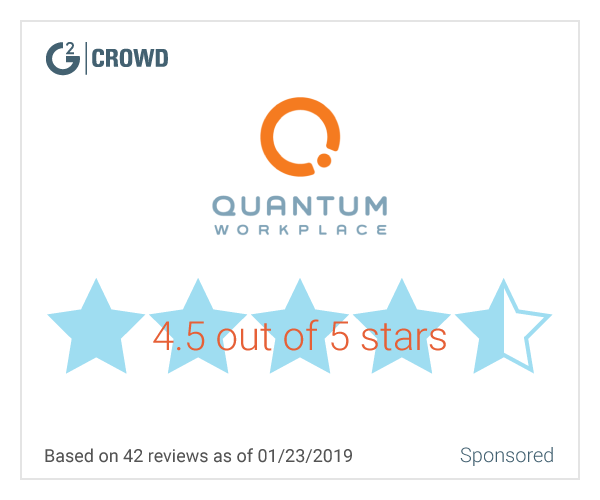 "This is exactly what I was looking for, and then some"
I was looking for a software solution that could help me learn more about my employees and how satisfied they are. We're a small team and sometimes getting a good feel for the culture can be challenging (you wouldn't think it would be so hard un a small team, but it is). We've been trying EPIC for a little over a month and right away I can see changes in the overall culture. The Claritywave team provided us with a whole bunch of printable materials that helped us create excitement among our team even before we launched. Right now we like everything so far. We're just trying it out at this point but we're definitely going to sign up as soon as the trial is over. We want to be able to get a good feel for our company culture and, more importantly, see in what areas we need to focus more. Also, we are using EPIC to incentivize our employees, thanks to the prize store. The system is super user-friendly and very easy to use. I highly recommend it. "Excellent tool to know the organizational climate and engagememt of employees"
EPIC is totally intuitive, with a gaming platform that allows employees to interact in a fun and friendly way. As an administrator, it offers me all the necessary tools to obtain reports and significant information to share with our top management, and take actions to provide a better environment and work space. We have been able to identify the weakest and most critical points that impact the level of commitment and collaboration of our employees. We started to work on solving business problems from the base of employees' interests and concerns. EPIC has allowed us to meet their basic needs, going through management and reaching the development and recognition. La visualización de tendencias y el progreso, además de la evaluación integral. La verdad aún no he encontrado algo que no me guste, en cambio la herramienta ha evolucionado y cambiando para mejorar. Hagan sesiones con sus colaboradores, que ellos conozcan los resultados y además integrelos como coordinadores por áreas para que contagien a los demás de EPIC. Como encargado del Clima Organizacional, EPIC me ha ayudado a detectar las"frutas podridas"; los colaboradores se hacen sentir y después de un año de uso han perdido el miedo y se expresan 100% sinceros. En mis sesiones no solo analizamos el clima desde EPIC si no que también analizamos otros factores que van asociados... además el poder analizar uno a uno es de mucha utilidad. "A great way to let management know how they are doing"
EPIC is very easy to use. I didn't really need to get any help from their support team. Once I logged in and set up my relationship network I was able to start answering the surveys right away. It's great to be able to let the management of the company know how they're doing. And it's also very nice to give my co-workers feedback as well. There are a few words in Spanish here and there, which I guess they forgot to translate and it made it a little confusing for a little bit. I told their support team and they said they would fix it. Nothing too bad. Letting management know how they're doing. I like many things about EPIC: first, the implementation and roll out has been very easy. The videos and content make it an easy product to use and adpt to. Secondly, the power on the product lies on many featuyres, such as the fact that there are many parameters that are being measured, the fact that I can configure exactly what info and from whom I need, and that is a continiuous and anonymous info so that it can really reveal relevant content to improve in decision making. I fully recommend it. Honestly? that not too many people use it. More people should use it. Take advantage od the ease of use to reconfigure. Decision making on who has skills, improve job management of the teams, better communication between teams, Better understanding on where are opportunoties to improve the business climate, how to become a better manager. Undetsnad what is not working with certain elements of the team. I love the fact that it has so many parameters. "EPIC is a marvelous tool, the most complete in the market today"
What we like most about EPIC is the ability to take the pulse of the company week by week. This has helped us very much in taking decisions and making the necessary changes at the right time. It´s very easy to use, all my staff loves it and they see a lot of value in their own reports, helping them get better. We are very grateful to have such a tool to improve our personal, team and company life. There´s nothing we dislike. ClarityWave is always there to help whenever we find a problem (which has only happened once in 2 years) and their monthly reports are very helpful. This is the best and most complete solution in the market today. 3. We have made decisions in terms of people: who to promote, who to coach, who to change to another department, etc. 6. it keeps us focused on the rights things, at the right time... not as before, when we had to wait 3 months to get results. 7. it helps us see what the company needs beyond the set questions, as we can add our own questions. "A truly versatile Culture Building tool"
I love the simplicity of the tool, it allows everyone to participate, it pinpoints areas that need to be addressed, it's anonymous which the staff appreciate, and it has a rewards and recognition program built right in. The live data has been so helpful in allowing us to better understand the culture and both address concerns, as well as recognize great work. Sometimes when clicking on the responses in the weekly survey, it's a little inaccurate (where you click), but that's not always an issue. Use the company's resources, they are always willing to help, take your needs into account and they're open to suggestions. It feels like they're there to support 24/7. We started using EPIC to address what we felt was a culture issue...we didn't have one. Since applying EPIC, we've seen a huge improvement in corporate culture, we've seen teams working together, we've seen a sense of overall appreciation in the company and most of all, staff feel enaged. "I've learned a lot about my company and my coworkers using EPIC"
I was looking for a software solution that would help me survey my employees to see how they were feeling or why they were not satisfied. EPIC has allowed me to pinpoint areas of opportunity that I would have never found on my own. Plus, I love the prize store and the badges and stickers that employees can give to each other when they wish to recognize them. This has really helped create a warm sense of community within our company. In the beginning I wanted to have the chance to add our own questions to the surveys (which I couldn't do). However, as luck would have it, when I asked their support team about it, I was told that this new feature has just come out and it does exactly what I need it to do. Using EPIC requires work. This is not a magic bullet and, both Management and the staff need to work together to improve a company's culture. Improving our company culture, reducing our turnover rate, learning more about our areas of opportunity. "Epic has changed the way we perceive the company leadership and the relationships among the team "
To be able to give and receive constructive criticism and feedback has helped me grow in so many key areas of my job, improved the perception other people have about me and thus improve my work relationships making the job easier and more fun every day! I am just an employee but I can tell the communications and overall team efforts are better and stronger than ever before. I have learned about the areas where I need to improve based on how other people perceive me and this in itself has been the biggest benefit. Also having a say and a word when it comes to proposals for new ideas and programs and being able to know the status and whether or not they will be implemented. "Excelente herramienta de integración y medición del ambiente laboral!" Nuestra experiencia con EPIC Clarity Wave ha sido muy enriquecedora, ya que hemos visto como los colaboradores se integran como equipo de trabajo y alimentan la información con sus respuestas, lo que nos ha dado datos de gran valor para la toma de decisiones. La herramienta es sumamente amigable y las personas poco a poco empiezan a identificarse con ella y a hacerla parte de sus actividades diarias. Además, la atención de sus administradores es siempre amable y eficiente, lo que le da un gran valor agregado! Felicidades!! Nada, todo ha sido bueno, desde la instalación que fue muy amigable hasta la atención constante y puntual de los administradores. Excelente opción para integrar a los colaboradores y medir el ambiente laboral de manera eficaz, dinámica y amigable. Hemos obtenido información valiosa para la implementación de calificaciones que nos ayudan a otorgar Becas, actividades de integración, reconocimientos y trabajo en equipo. "Great software and an even greater team"
I like how easy it is to use and how much information I get from the surveys. I also love to see which of my employees are causing more tension among the rest of the team. Setting up the store is a bit laboriuos but that's because we wanted to add a lot of prizes to it. I can find problem areas (or people) very easily and I can also identify my top employees simply by looking at their personal scores. "I learn a lot about myself every week"
I love the idea of evaluating our coworkers and being able to reward them for good actions. The prizes are also a great motivator for us and they keep me coming back every week. until now I have not found any negative issues when using this software. I think it's a great product overall and I would recommend it to anyone who wishes to improve their team. Self improvement because I get to see my own scores every week and see if I'm doing better or worse than the previous one. "This is a great idea for all types of businesses!" When my boss told us they were going to buy this software I thought it would be a very boring chore (like the other surveys I had to do in the past). But right away I say that it was different. You can earn badges and different levels and also win points to buy stuff at their store. Some of the best prizes are a bit expensive and take many weeks of answering questions to win them. However, in all fairness, when I asked their support team they told me that each company manages their own store and which prizes to offer, so I guess it's not EPIC's fault. Make sure that you have a wide variety of prizes. Some free and some more expensive so that employees can start winning them in a short period of time. Turnover is pretty high in my job so I guess this software is helping the staff be happier at work. I've heard some of my coworkers say that they've also seen some positive changes in our department. "I love learning about myself and sharing my ideas with my company." EPIC is very easy to use and it doesn't take any time at all to rate the company and my teammates. I also like to be able to contribute my ideas and having other people vote on them. It's great when I find out that they have implemented some of them. Hmm, nothing really. The only thing I guess don't love is that I cannot see my own scores on my mobile and I have to go to the desktop to see them. But it's not a big deal. Plus there's a lot of information that probably wouldn't fit in my small screen. The whole idea of knowing what my teammates think about me has helped me become a better person. I also see some positive changes in the company. It's really nice to see that they're listening to us and paying attention. "Ha sido sumamente interesante y ha ayudado a integrar a los colaboradores de la compañia"
La interfaz que es bien intuitiva y llamativa para los usuarios, la tienda de caje genera muchos comentarios positivos. Por el momento no he ha disgustado nada. Realizar campañas internas de comunicación para que los colaboradores utilicen la herramienta, ya que muchas veces se les olvida ingresar que es lo que alimenta la plataforma. El hecho de poder generar comentarios de una forma diferente y creativa crea un buen ambiente a los compañeros. Las encuestas de clima laboral me dan una re alimentación de los pensamientos de los colaboradores para la toma de decisiones y puedo tener un panorama claro de lo que los colaboradores quieren. "Excellent and comprehensive system which exceeded what we thought were our requirements!" Fun, colourful, quick and simple but smart system. Clarity Wave is excellent from many aspects. For myself, as I put on my HR/ Management Team hat, it provides real time employee engagement feedback and stats about the company, but also about the teams, departments etc. through a range of filters. This helps me to easily summarise and give actionable and real data to the Management team. As an individual, being able to know how I am perceived by my team/ peers etc. is hugely powerful. It is a safe environment and allows you to see areas you're doing well in, and the areas in which you could improve. Above and beyond, earning points to use in the Store is an awesome incentive for the team and achieves a win-win for the company and the individual. These are just a few of my favourite things about Clarity Wave. There has been nothing in our Clarity Wave experience that we have disliked. This gives us important insights on the way the team are interacting and engaging on a company level, but also on a team to team and then individual to individual level. It highlights things (both good and constructive) that you may not have known, but also helps to articulate other things that you may not have put into words or actions before. Business is really about people first and foremost and if you spend time and so called 'get this part right'; the rest will really flow on. "I am happy my employer hired this company"
I like answering questions about my employer, the vision and future of the company. I also like answering about my fellow employees. I would love to have an app that is on my phone but I also don't mind logging in the software every week. Giving my opinion to the company. "This is a great extra perk for employees!" I like to earn points by answering the surveys and to be able to trade them for extra benefits like a gift card or a free day off from work. Nothing much. I like the application a lot and so do my team mates. "Easy way to rate your workplace." Being able to discreetly say who is actually doing what is needed around the office and the points to earn prizes. Nothing I think it is a great tool to use in the office. Being able to give recognition to those who deserve it. "EPIC by name and by nature!1"
The prize store and peer recognition. This really engages the team and lets them feel rewarded for participating in the program. The relationships are a bit tricky to set up but have just recently been upgraded so they are much more intuitive. Set up good relationship rules at the beginning. Clarity Wave will help you with this. Understanding our HR weak points was difficult. EPIC has enabled grass roots feedback direct to senior management. "A really great tool if you're looking to improve your company's workplace climate." We are a small company and, for the most part, we know each other pretty well. EPIC allows us to dig deeper and find any hidden issues. Because the application is anonymous people feel comfortable answering the questions. Plus, it's a great way to reward our staff for participating in our growth. There's nothing I don't like about it. It does what I need it to do. I wanted to be able to create a workplace that I could be proud of. With EPIC I think we're getting there. The mere action of interacting the system every week keeps everyone aware of what we're trying to improve. "Companies need this tool to listen to their employees." I'm always very happy to give my opinion anonymously especially since companies here are starting to open up to this concept. Epic makes it very safe and easy to answer the questions. Some of the questions might sound a bit too americanized for my taste, but it's only my opinion. Being able to give my opinion in a safe and trusted website. "EPIC allows us to immediately pinpoint problem areas, especially with our remote teams." We have a few employees that work remotely and being able to make them feel part of our company, through the weekly surveys, has done wonders for morale. Plus, it's super affordable for us. At this point I cannot think of anything we dislike. We are in the technology service industry and we deal with people with all kinds of personalities. Some of them are introverts and we almost never hear from them. EPIC has given them a "voice" to express their ideas. They also love to recognize their coworkers with points and stickers whenever they receive great service from them. "This software lets me give my opinion about my company and my colleagues very safely and easy"
As a systems engineer I have to interact with a lot of people. EPIC allows me to score them and be scored by them in many different areas. I like the anonymity aspect of it because it lets me answer honestly. I also like seeing what they think of me and how I can be better at my job. I think our company has benefited a lot by having this system mainly because of the improved morale among all of us. It's nice to be heard and I believe everyone appreciates it. "Great solution to keep up with the company pulse"
I like to be able to see each individual score. This is very important to me and the other managers as we can more easily work with each individual. Setting up the relationships correctly requires some thought but it's well worth the extra effort. Reducing turnover and improving the overal climate in our company. Being able to get honest feedback from employees in a simple manner. It's great! Nothing that I can think of!! It's a great and valuable tool! Where our strengths and weaknesses are internally. We get a lot of feedback from employees that normally wouldn't be honest with us about our company face-to-face. "A wonderful Employee Engagement tool"
Customization of weekly questions, ability to gather anonymous feedback, and the overall user friendliness. EPIC has really helped us to understand the culture within the company, the gaps within the culture and has improved overall employee engagement within the organization. "Es una herramienta muy amigable, fácil de entender y de utilizar." Los reconocimientos se han aumentado y le ha dado una voz al empleado que antes no tenia. * We monitor all Clarity Wave reviews to prevent fraudulent reviews and keep review quality high. We do not post reviews by company employees or direct competitors. Validated reviews require the user to submit a screenshot of the product containing their user ID, in order to verify a user is an actual user of the product.